Some of you may remember filling out an online survey in 2014 about your relationship to the Brethren in Christ Church, your Christian beliefs and practic- es, and the level of your agreement with various statements regarding contempo- rary social issues. During 2014, twenty-four Anabaptist groups around the world participated in the Global Anabaptist Profile, including four Brethren in Christ conferences (Canada, Malawi, United States, and Zimbabwe). Ronald Burwell, professor of sociology emeritus at Messiah College, who helped to conduct previ- ous similar surveys of the Brethren in Christ Church in North America, served as the research associate for the Brethren in Christ, and has completed his summary of the United States portion of the survey of the Brethren in Christ. That summary is the lead article for this edition of the journal. Since the Global Anabaptist Profile research project was done on behalf of Mennonite World Conference, it is fitting that this edition also includes an article by J. Nelson Kraybill, who was installed as the new president of Mennonite World Conference at the global assembly held in Harrisburg, Pennsylvania in July 2015. He succeeded Danisa Ndlovu, former bishop of the Brethren in Christ Church in Zimbabwe. Kraybill’s article is based on his presentation at the annual Schrag Lec- ture at Messiah College in March 2015. In the third article, David Miller, a Brethren in Christ pastor in Montreal, Quebec, builds on the research he did for his doctoral dissertation to suggest a way for a church committed to Evangelical theology to construct helpful conversations on peace. 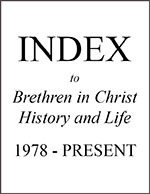 He references Brooke Strayer’s article in the August 2015 edition on the Brethren in Christ peace position as a starting point for his efforts to address the disagreement in the denomination on this issue that she identified. We conclude with several reviews of books from a variety of genres, including biography, history, theology, and ethics. This edition marks the end of Devin Manzullo-Thomas’ time as assistant editor for the journal. Devin is currently working full-time at Messiah College while he also pursues a doctorate in American history at Temple University. Managing that load as well as other responsibilities, leaves him little space for the duties as- sociated with being assistant editor. I (Harriet) have deeply appreciated Devin’s expertise, not only in matters of church history but also in the logistics of putting together the journal. I will miss working with him. We all hope that at some point in the future, he will be able to return to a role with the journal and the Historical Society. Devin has also been serving as the journal’s book review editor for a number of years, and I’m pleased to announce that Dr. Nancy Heisey has agreed to assume that role with the journal, beginning with the April 2016 edition. Nancy is a professor in the Bible and religion department at Eastern Mennonite University and a lifelong member of the Brethren in Christ Church.